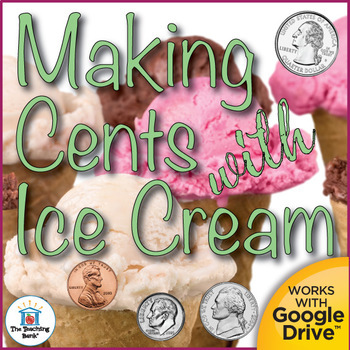 Making Cents with Ice Cream, which works for both print and Google Drive™, is a Common Core Standard aligned Math Center manipulative activity to give practice with coin value and counting. You can use this printable manipulative activity in a learning center or for file folder games. The Google Drive option allows you to share a prep-free paperless interactive version for your students to complete. • Guide with link to Google Drive file and instructions on how to use. •30 Ice cream cones with a different value of coins on each. •60 Vanilla ice cream scoops depicting quarters, dimes, nickels, and pennies. 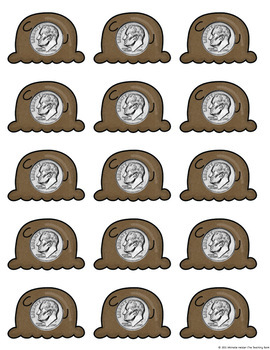 •60 Chocolate ice cream scoops depicting quarters, dimes, nickels, and pennies. 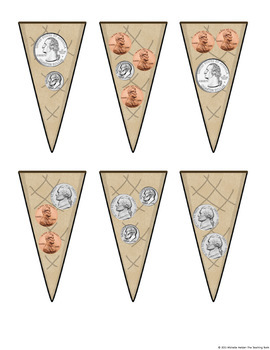 •60 Strawberry ice cream scoops depicting quarters, dimes, nickels, and pennies. •Common Core Standards Checklists for grades 1-4.